A Comic-Con Diary: The Eisner Awards Glen Weldon gets the stink eye from a legend of the comics industry, enjoys hijinks onstage, and has to pee in the middle of the ceremony. The 2013 Eisner Awards conclude with Chip Kidd planting one on Neil Gaiman over the jealous protestations of Jonathan Ross. 8:28 p.m.: Jennifer and Matthew Holm are an adorable brother-sister team. They are standing at a podium less than 6 feet away from me and thanking their publisher, because their charming book, Babymouse for President, has just won the Eisner for Best Publication for Early Readers. They are beaming, humbled, happy. I, too, am happy for them. I am also a terrible, terrible person, a base, disgusting, self-obsessed churl, because even as I applaud their well-deserved success, my mind floods (DON'T SAY FLOODS) — fills with images of dry and parched vistas, of deserts, of canyons, of dust-choked, sun-scorched mesas, because I have to pee like a racehorse. Like two racehorses. Like a team of Clydesdales. Bladders don't explode, do they? That's not a thing that can happen, right? Do humans have, like, gaskets? Blowable gaskets? What happens to a pee deferred? It doesn't dry up, I'll tell you that for free. A shelf at the rear of the stage holds the remaining Eisners to be given out. The 25 remaining Eisners. Plus the six inductees into the Hall of Fame, and the In Memoriam (presented each year by the great and good Maggie Thompson), and the Bill Finger Writing Award, and the Retailer Award, and the Most Promising Newcomer Award, and the Humanitarian Award. In that shelf I see the next two hours and 29 minutes stretching before me. It is a grim, dystopian future. Like The Road, but with lower abdominal pain. OK, this is dumb. Yes, given that my seat's up at the very front, getting up and dashing to the restroom will be disruptive as hell, but there's nothing I can do. And anyway, look — there's another latecomer sneaking over to his seat at the next table. It's a thing that happens. People will understand. I nod at the guy, a gesture of guilt-ridden kinship: We Few, We Happy Few, We Band of Skulkers. It's then I realize that the skulker in question is Neil Gaiman. And he looks sheepish and apologetic — more than baseline, anyway — about arriving late. Neil Gaiman — who would be within his rights, given the room, to make an entrance like Gaga, riding in on a gryphon, tossing gold doubloons and Tori Amos albums into the crowd — looks guilty about interrupting the proceedings. But there's nothing for it. I hold out as long as I can — 13 more awards — before physiological imperative trumps politesse, and I duck out. The fact that I am doubled over in pain as I go makes it easier for people to see over me. So, you know: Bonus. 10:00 p.m.: I return in time to see the great and good Maggie Thompson take the podium to introduce the In Memoriam segment. The respectful applause gives me cover as I return to my seat, breathing easier. Three awards later, I feel the hairs on the back of my neck stand up. I turn to see a legend of the comics industry — who will remain nameless — staring at me as if I am a small, stubborn stain. My face reddens, thinking my clumsy, disruptive pee-break the source of his antipathy. But no: His disdain is directed at the phone I'm holding in my hands. The phone onto which, for the past hour and a half, I have been dutifully typing the names of each category's winners. An act that looks, to the outside world — more specifically, to this man, who wrote the first comic book series I ever loved and obsessively collected — like I'm a Ritalin-chomping tween texting my BFF LOLs and OMGs and ROTFLMAOs. Stupidly, futilely, I raise the phone, and mouth the words "NOTES. TAKE-ING NOTES." He ignores this, of course; I watch as his withering gaze slides slowly off of me and returns to the stage. Winning friends and influencing people everywhere you go, Weldon. 11:15 p.m.: The Eisners are over. Among the awards presenters of whose nostril linings I've now been treated to an alarmingly close and unobstructed view: Edward James Olmos. John Barrowman. James Marsters. Chris Hardwick. Again and again over the course of the evening, many presenters and winners broke from their scripts to pay tribute to the late editor and publisher Kim Thompson, whose efforts transformed the landscape for alternative comics in North America. Thompson, who died last month, was co-publisher of Fantagraphics Books, a beloved editor and known throughout the industry for his especially skillful translations of comics from European countries. You can find a complete list of Eisner nominees and winners on Michael Cavna's Washington Post blog, Comic Riffs (Cavna was one of the Eisner judges this year). The smart, funny, gorgeous, genre-blending Saga, by Brian K. Vaughan and Fiona Staples, won Best New Series, Best Continuing Series, and Vaughan took home Best Writer as well. Tough competition (Fatale, Hawkeye, Manhattan Projects, Prophet and more) but well-deserved. Chris Ware's meticulous masterpiece Building Stories won Best New Graphic Album, Best Writer/Artist, Best Lettering and Best Publication Design. Ware wasn't at the ceremony so his colleague Chip Kidd, book design doyen, accepted these awards on his behalf. Kidd began the evening by informing the audience that he'd met a 300 Spartan warrior on the Con floor, and he wasn't sure if his muscles were real or a costume. "So I stood there thinking I could be on time to the Eisners," Kidd purred, dosing the room with his full-tilt Tallulah, "or I could touch that fle-e-e-e-esh." As the evening continued and Ware's trophies piled up, Kidd's affect somehow managed to grow even larger and more flamboyant. A glass of white wine sloshing in his hand, Kidd would (there is no other word that fits) swan onto the stage to own the podium with louche asides and callbacks to his 300 beefy bohunk. The audience (at least the part of the audience made up by me) ate it up. 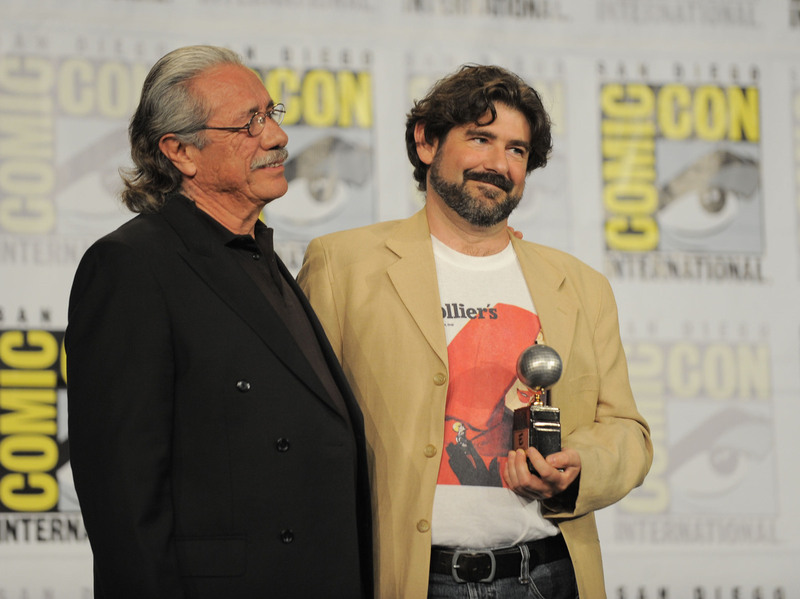 Actor Edward James Olmos (left) presents Juanjo Guarnido with an Eisner Award for his book Blacksad: Silent Hell on Friday. In a rare tie, both David Aja (Hawkeye) and Chris Samnee (Daredevil, The Rocketeer) won best penciler/inker. Aja also won best cover artist for Hawkeye, and Juanjo Guarnido received a Best Painter/Multimedia Artist Eisner for his work on Blacksad. This is only meet: Hawkeye looks like nothing else on the stands; the book's innovative approach to visual storytelling is, month in and month out, a steady source of delight. Irascible button-pusher Tom Spurgeon won best Comics-Related Publication/Journalism for his indispensible site of comics coverage and commentary, The Comics Reporter. Bookmark it. Sean Howe's exhaustive and engaging Marvel Comics: The Untold Story took home Best Comics-Related Book. Howe really captures how editorial personality clashes rippled through the Marvel books, shaping and reshaping classic characters and storylines. The collected edition of Brandon Graham's trippy, funny and deeply, gratifyingly weird series King City won Best Reprint Graphic Album. The final awards of the evening were presented by Gaiman and British TV host/comics fan/writer Jonathan Ross. The pair performed a bit of business that hearkened back to their 2007 joint appearance at the Eisners, when Ross surprised Gaiman with a passionate onstage kiss. This time, the schtick they trotted out had grown more meta: Ross asked Gaiman to close his eyes so he could surprise the author by having an unknown woman kiss him. Said woman turned out to be John Barrowman, who instead planted one on Ross. Hijinks! Gambols! No small amount of gay panic! Audience "woo"-ing! Etc! As the evening concluded, with Ware's win for Best New Graphic Album, Kidd once again accepted — and drew Gaiman into a deep, lingering kiss. Good night, San Diego! See you next year! 11:20 p.m.: After a spate of fruitless email back and forths and near misses throughout the con, I am finally talking to Rob Salkowitz, author of Comic-Con and the Business of Pop Culture. Specifically, I'm asking him how the world has changed in the year since he finished the book, which lays out four distinct scenarios for the future of "comics culture." He introduces me to his wife, Eunice, and to writer and publisher Batton Lash, with whom I enter into a passionate discussion about Mort Weisinger's editorship of the Superman titles, a conversation that could only happen here. 12:05 a.m.: It's time to walk Maggie Thompson back to her hotel. In a perfect world, we'd grab a cab — the heels she's rocking are chunky, yes, but they are tall. There are no cabs to be had, so we trudge the mile back to the Marriott, comparing notes. This time we need not navigate through clusters of anime heroes or video game villains. The sidewalks are empty, but there is a tent city set up in a cordoned-off area to our right. Not protesters, not the homeless — just kids and moms and well-fed college students waiting in the Hall H line for tomorrow's slate of panels. Maggie deposited safely back at the elevators, I ask the valet to hail me a cab for a trip back to Coronado. My body hasn't adjusted to the time zone. I am bone-tired, but I resolve to try to crank out at least some of today's Con Diary entry before going to bed. I have to be up at 7 a.m. to tape a two-way with Weekend Edition Sunday. I make it back to the hotel room and fire up the laptop. Crack my knuckles. And begin. 3:47 a.m.: I lift my head from the keyboard to see that my Con Diary consists of 13 single-spaced pages filled with the letter "n."